The Impressions’ gospel-rooted rhythm ‘n’ blues, prominent on the pop charts during the struggle to end Jim Crow’s dominion, has been called the soundtrack of the civil rights movement. They have a rich history. Founded in Chattanooga, Tennessee in 1958–Sam Gooden, at left in the photo above, was a founding member–they later moved to Chicago and added Jerry “The Ice Man” Butler and Curtis Mayfield. Fred Cash, at right in the photo, joined in 1960. Butler left in 1962. Mayfield, who wrote many of the group’s best loved songs, stayed until 1970. After launching his solo career, Mayfield maintained a close relationship with the Impressions, continuing to write material for and produce them. He died on Boxing Day, 1999. 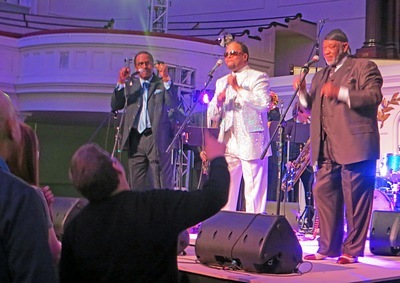 After many changes in personnel, Mayfield’s position as lead singer is now ably–in my estimation–filled by Reggie Torrian, at center in the photo. 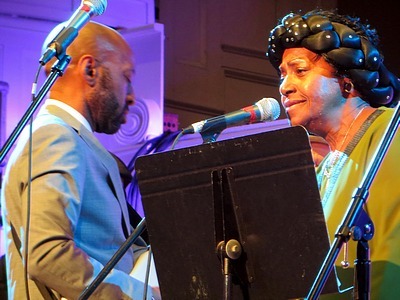 In July of 2013 The Impresssions released a single, the Mayfield penned “Rhythm,” on Brooklyn’s Daptone Records. 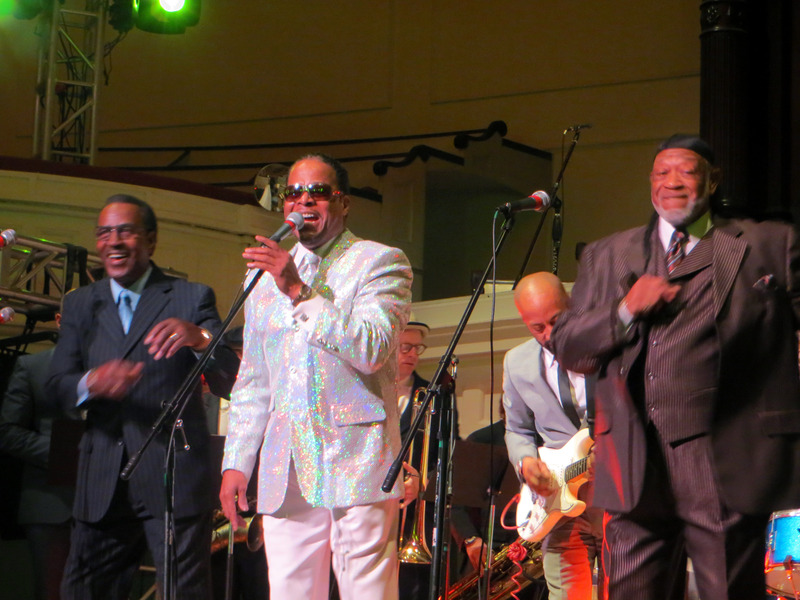 The Impressions were the headline act for Saturday night’s “Free the Slaves” concert at Plymouth Church. Before the music began, The Rev. 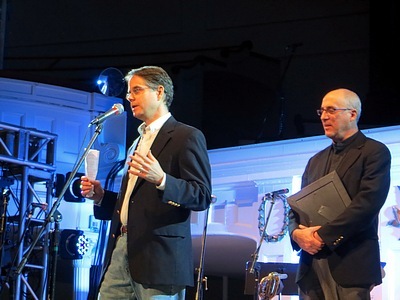 Al Bunis, Plymouth’s Interim Senior Minister, introduced Maurice I. Middleberg, Executive Director of Free the Slaves, an organization devoted to ending slavery in the contemporary world. 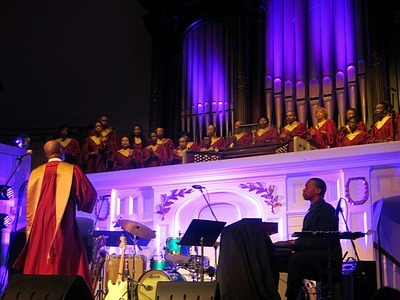 The Inspirational Voices of Abyssinian began the concert, opening with a spirited rendition of “Freedom’s Way,” and finishing their set with a rousing South African song that had the audeince clapping, shouting, and singing along. 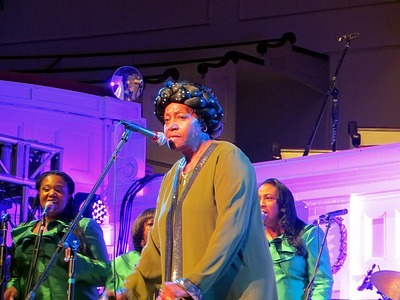 Next up were Naomi Shelton and the Gospel Queens. They opened with the classic “One More River to Cross,” followed it with Sam Cooke’s “A Change is Gonna Come,” and finished with an intense “What have You Done?” Ms. Shelton’s vocal dynamics were enthralling. 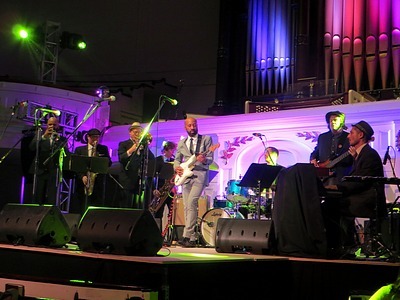 Before the Impressions took the stage, there was a lively instrumental interlude performed by Daptone records’ The Dap-Kings, featuring Binky Griptite on guitar. 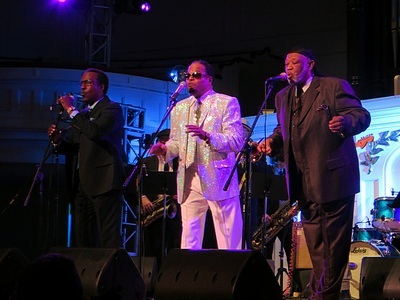 The Dap-Kings remained on stage to serve as the Impressions’ backing band, with the addition of Fred Cash’s son on bass. Their next song, “Choice of Color”, waa released in 1969, a time when racial tensions were high. They were slated to appear on a late night talk show, The Joey Bishop Show, but before they went on they were told that ABC management had decided they should not do this song. They told Mr. Bishop, who said they should go ahead and sing it. “Choice of Color” was followed by a rousing “This Is My Country”. Called back for an encore, they closed the show with the romantic ballad “I’m So Proud”, which showcased Mr. Torrian’s soaring tenor. Thanks so much, Claude, for this wonderful review.